. 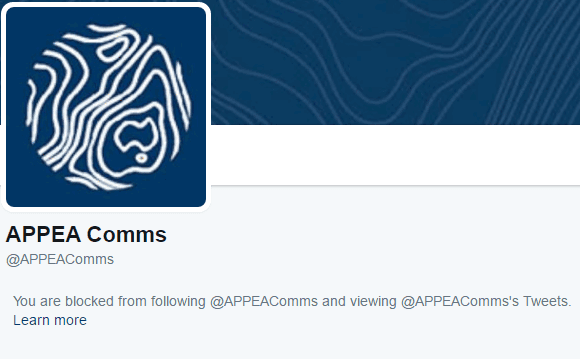 @APPEAComms Equipment to cut energy consumption is real.
.@APPEAComms Poor analysis of facts. 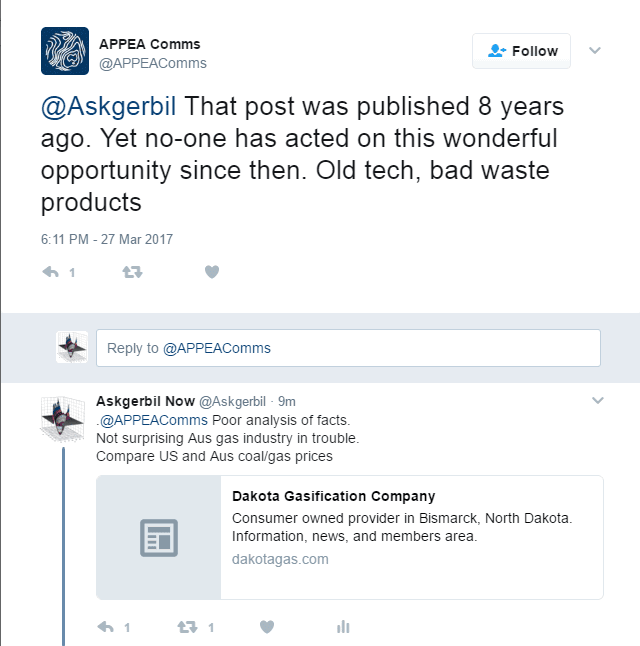 Not surprising Aus gas industry in trouble.
.@APPEAComms A very different answer to: "That post was published 8 years ago. Yet no-one has acted on this wonderful opportunity..."
Increases in energy costs are a signal for industry to audit its energy use and survey new plant that lowers energy use. Yumbah Aquaculture at Port Lincoln, on South Australia’s west coast, received an electricity contract quote for $1.35 million, $650,000 more than its current $700,000 contract. The 2016-17 Mid Year Budget Review provides $31 million over two years to help large South Australian businesses manage their electricity costs. The Energy Productivity Program will be available to businesses that use more than 160MWh of electricity each year to incentivise investment in energy saving measures. The funding will be available for businesses to undertake energy audits of their facilities to determine where efficiencies can be made. The audits will also make recommendations about technology or infrastructure upgrades that could be carried out to reduce cost and grants will be available to implement the those recommendations. One area to examine in an energy audit at Yumbah Aquaculture is the circulation of water from sea level up to its abalone growing tanks and back into the sea. The energy needed for pumps to raise water by, say, 20 metres is the same as the energy that is available when the same volume of water falls by 20 meters. Adding a micro hydro generator on the outflow from abalone growing ponds could generate almost as much energy used by the pumps to raise the water. The value of the energy savings may make it worthwhile to invest in a micro hydro generator. The food processing industry in Victoria has received quotes for natural gas with prices more than doubling in just a few years. Echuca-based food processor Kagome expects to pay $3.6 million for gas this year, up from $2.4 million last year, despite plans to use less gas. Kagome employs more than 200 people. Kagome Australia's processing plant receives about 4,000 tonnes of tomatoes each day during the harvest period of 70 days. Natural gas is used to evaporate water from the tomatoes for the production of tomato paste. Evaporating 1,000 tonnes of water from 4,000 tonnes of tomatoes each day can use an enormous amount of energy. This isn't necessary but it depends on how it is done. One way to evaporate 1,000 tonnes of water that does use an enormous amount of energy is to simply put batches into large cauldrons with gas burners beneath them. Allow the tomatoes in the cauldrons to simmer until the desired volume of water has evaporated. This way requires 2,257 gigajoules of thermal energy that converts 1,000 tonnes of water into steam. If this heat energy is supplied by natural gas costing $9 per gigajoule, the daily energy bill would be about $20,000 and the total bill over the tomato harvest period of 70 days woul be about $1.4 million. There are several other ways to perform the same process using much less energy. For instance, the energy needed to convert 1 kilogram of water into water vapour is 2,257 kilojoules. The same amount of energy can be recovered when that kilogram of water vapour is condensed back into water. The mechanical vapour compressor uses a very small amount of electrical energy to transfer a very large quantity of heat energy from the condensing steam back into the cauldron of tomatoes where it boils off an identical amount of water. The cost saving of this method is all of the natural gas used in the inefficient method of converting 1,000 tonnes of water into water vapour. 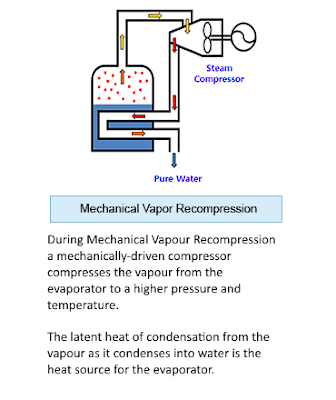 This method also produces distilled water while continually recycling the latent heat of evaporation in the water vapour as it condenses back into water. The condensed water produced may have some value too as a pure, distilled by-product. Equipment using this method is commercially available. One type is marketed as "forced circulation evaporators". These are for concentrating fruit paste (tomato paste, peach paste, apricot paste and etc.) and some other products with high viscosity. Another type is marketed as "falling film evaporators". These are for concentrating products with low viscosity, for example: fruit juice, milk etc. 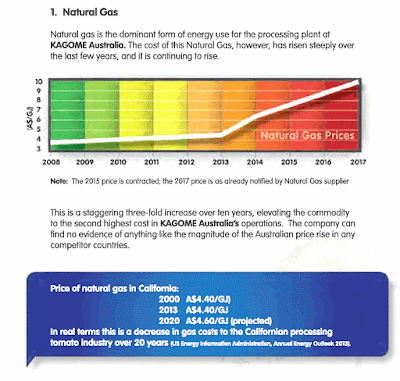 The value of the energy savings may make it worthwhile for Kagome Australia to invest in a forced circulation evaporator and eliminate the need for natural gas. When people think 'energy storage' batteries often are the first option that comes to mind. A battery that has been discharged down to 25 percent of its capacity may hold, say, 3.6 gigajoules of electrical energy. 'Recharging' the battery, adding more energy, could increase the energy stored to, say, 14.4 gigajoules of electrical energy. This is the same as 4 megawatt-hours of electricity. Another option for energy storage doesn't need a battery. 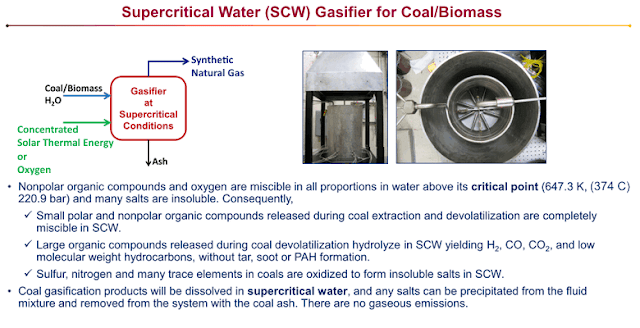 Think of brown coal as a 'battery' that has been almost completely discharged. The amount of brown coal that can deliver 3.6 gigajoules of electrical energy - if it is burned in a coal-fired power station - contains about 380 kilograms of carbon. Instead of burning the brown coal, energy can be added, in a similar way a battery can be 'recharged', so that it can deliver 15.5 gigajoules of electrical energy when needed - if it is burned in a combined-cycle gas turbine power station. There's no need to understand the chemical reactions in a battery when it is being charged and discharged. There are many types of batteries and the chemicals and chemical reactions in each type are quite different. When renewable energy is stored by adding it to brown coal, chemical reactions also take place, and achieves the same result as recharging a battery - but without the need for the battery. Simplified process flow diagram of the supercritical gasification system developed by Gensos. Natural gas power is increasingly unreliable in Australia. 6 gigajoules of natural gas are needed to generate 3.6 gigajoules of electrical energy in a combined-cycle gas turbine power station. Each 3.6 gigajoules of electrical energy (which is 1 megawatt-hour or 1 MWh) has a price of about $50 in the Australian Energy Market Organisation's National Electricity Market. 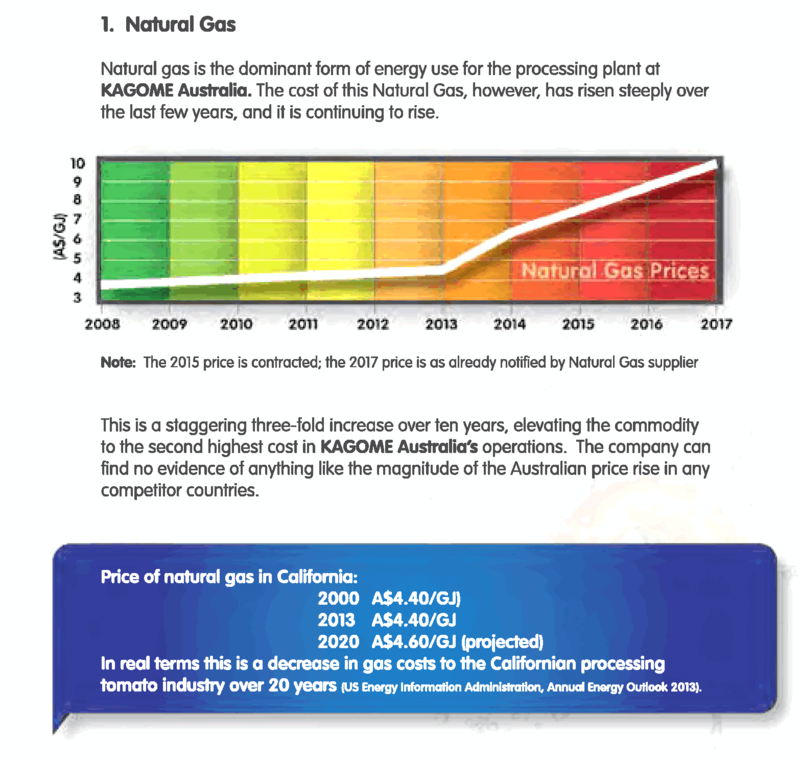 The natural gas used to generate this electrical energy costs about $9 per gigajoule in the Australian Energy Market Organisation's Wholesale Gas Market. It costs about $54 for the natural gas used as fuel to generate each megawatt-hour of electricity. This has a wholesale price of only $50. Gas-fired power fails to supply South Australia electricity. In terms of production costs, over the last decade the finding and development costs for the petroleum industry have increased six-fold. And, in the three years to 2013, total Australian finding and development costs averaged $4.16/GJ, which was 2.7 times the average for the three years to 2007. These rising costs are partly explained by the fact that unconventional gas production involves significantly higher capital expenditure than that of conventional off-shore wells, given that CSG requires multiple wells to be drilled in order to access equivalent volumes of gas. The projected US exports of around 7 trillion cubic feet of natural gas, or about 140 million tonnes of LNG is almost double the projected Australian exports of 85 million tonnes of LNG per year. 1 metric ton liquefied natural gas (LNG) = 48,700 cubic feet of natural gas. 1 trillion cubic feet of natural gas is about 20 million tonnes of LNG. 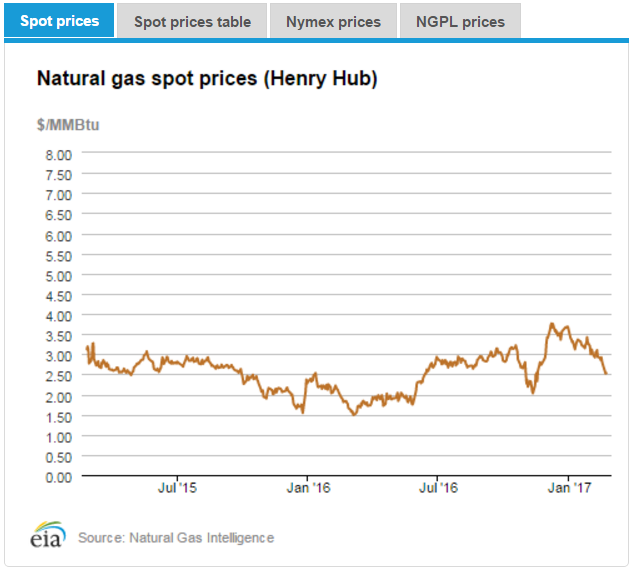 Given the much higher cost of producing coal seam gas in Australia, the ramping up of US LNG exports to 2020 is likely to bring the enthusiastic expansion of coal seam gas in Australia to a sudden end.